An array of appetisers is served daily across India in many delicious combinations. Indian snacks (Namkeens) make a welcome beginning to any meal and this opportunity to 'dip in' to a range of delicious flavours is not to be missed. A testament to the art of combining fine ingredients to produce a sublime taste. We pride ourselves on using wonderfully fresh ingredients to their best advantage to create a range of delectable starters, inspired by authenitc recipes from across the Indian continent, full of flavour and visual appearance. Indian Ocean's classic, lightly spiced, deep fried onion with a light gram flour batter and fresh coriander. A meat samosa of finely minced lean lamb, onions, fresh coriander and Indian spices wrapped in a crispy pastry wrap. Two pieces of flaky white sea bass coated in a light spicy batter of cumin, coriander and onion seeds. A delicately spiced patty of tender chicken with lentils, coated in a light egg batter and gently pan friend. Pieces of tender diced potato with carrot and peas, combined with fresh coriander and delicate spices in a piping hot crispy pastry wrap. Potato patties spiced and enhanced with pomegranate seeds and deep fried, in a fine coat of gram flour batter. Prawns on a bed of crispy lettuce covered with seafood sauce, garnished with chopped cucunber, tomatoes and a slice of lemon. Tasty whole mushrooms cooked to perfection in lightly spiced crispy batter. Delicately seasoned fritters of chicken tikka in the lightest coating of gram flour batter. Indian Ocean's award-winning dish � succulent flakes of fish lightly spiced and mixed with fresh mashed potato, coated in breadcrumbs and deep fried. Served with a tangy tartare sauce. Delicious spicy ingredients cooked to perfection and served on a small round, unleavened bread. Chicken tikka diced in a spicy sauce,served on a puri bread. Stir fried curried glazed prawns in a tantalisingly delicate medium spice flavour, served on a puri bread. Hyderabad's 400 year old culinary history, like its culture, is well known throughout India and Biryani is its most talked about dish. Bringing something of the Hyderabadi ethos and personality to this famously splendid taste, Indian Ocean Biryani dishes are meals in themselves, served with a special touch that makes them truly irresistible. Served with a fresh omelette and a curry sauce of your choice. A beautiful dish created by our team of chefs and afavourite of our regular diners. This dish is cooked withpilau and saffron rice together with chicken, lamb,prawns, lightly fried onions and exotic spices.Served with raita and salad. Tandoori King Prawns cooked in butter and delicate flavourings derived from saffron, cumin, coriander seed, peppercorns, cardamom, mace, with a hint of garlic, freshly crushed ginger and lemon juice cooked with the finest Lahori Basmati rice with channa. A refreshing, aromatic dish. The choicest lamb, chicken and prawns cooked in an exotic mix of spices with peas and saffron rice. This dish is served on a bed of fresh lettuce and topped with an omelette. Pieces of chicken and lamb tikka, king prawn tikka, stir-fried with peas, onions, saffron, cashew nuts, pistachios, almonds and sultanas together with basmati rice. Prepared by gently cooking saffron flavoured basmati rice with a mixture of mild aromatic spices. Served with a fresh omelette and a curry sauce of your choice. With its abundant variety of traditional spices and an enviable location on exotic trade routes, India has enjoyed many influences from which to develop its cooking traditions. Grilling and barbecue cookery has been at the centre of the country's favourite recipes for centuries. All dishes can be served with a curry sauce of your choice as listed in the sundries section. Tender pieces of chicken breast marinated in a garlic sauce and garnished with corriander. Beautiful chunks of chicken breast that we marinate and then cook in the tandoor on a skewer. Chicken marinated and spiced with fresh herbs and spices, skewered and roasted, served with grillled green peppers and onions, accompanied by salad. Generous pieces of barbecued chicken that are especially juicy and succulent with a light and mild spicy barbecue flavour reminiscent of an original Kashmiri recipe. Chunky grilled chicken marinated in a yoghurt dressing flavoured with lemon and garlic and rolled in a blend of green leaves, herbs, fresh coriander, shallots and green chillies. Finely-minced lean lamb mixed with onion and Indian spices and barbecued. Thick chunks of especially tender lamb marinated and then cooked in the tandoor on skewers. Deliciously wholesome fresh lamb chops, marinated in our own special combination of Tandoori spices with a hint of garlic and ginger. King prawns marinated in a lemony sauce and natural yogurt with an assortment of exotic tandoori spices, skewered and charcoal grilled. Chicken Tikka, Garlic Chicken, Tandoori Chicken, Seekh Kebab and Lamb Chops. Succulent slices of grilled lamb marinated in a spicy sauce of crushed red chillies,garam masala and traditional herbs. Pieces of chicken tikka enhanced with shashlick spice mixed and served with tandoori peppers, onions and tomatoes. Love Tandoori chicken tikka but like an extra kick? This dish is for you. Succulent chicken breast pieces marinated in a unique blend of Madras spices. Love Tandoori chicken tikka? Want an extra kick? This dish is for you. Succulent chicken on the bone in a unique blend of Madras spices and roasted in the Tandoor. Delicious cubes of marinated Indian cheese skewered with onions and peppers and cooked in the Tandoor for that authentic charcoal flavour. Hot, spicy and irresistible! Choose from a mixture of regional favourites and Indian Ocean exclusives. A southern Indian dish, with a hot and spicy taste, prepared with fresh herbs and tomato puree. Originally a Portugese dish it was transformed in colonial outposts to become the British favourite. A fresh but fiery curry with tomato puree and herbs. Not for the beginner. Like its more famous cousin, dhansak, patia is a Parsee dish. Lightly-fried onions cooked with tomatoes to a natural red sweet and sour sauce. A hot dish with a distinctive aroma, garnished with fresh coriander. Methi is the Indian name for the herb fenugreek, which has a distinctive taste and aroma. The curry is medium strength cooked with garam masala, fresh onions and of course fenugreek. Mild and creamy but never bland, a traditional Korma requires long slow cooking of marinated meat abraised on a very low heat until all of the juices condense down into a thick sauce with ground almonds, coconut and thick cream. A famous Parsee dish, often known as 'sweet and sour with lentils and pineapple'. A fabulous curry with mouth watering flavours and textures. This is a style of cooking where the spices are gently fried to bring out their flavour before they are used in the recipe. Dishes are made with meat cooked in its own juices for a deep strong flavour but very little sauce. Originally from Kashmir this dish is equally at home in the Punjab. An authentic Rogan Josh is delicately spiced and cooked to its distinctive red colour with the use of sweet pimentos, capsicums and tomatoes. This is a classic Indian dish. Dopiaza uses onions in two different ways, fried and boiled, at different stages of the cooking. The restaurant version has small fried pieces of onion in the sauce and then larger chunks of lightly cooked onion added towards the end of cooking. A real treat for chilli lovers! Fresh green chillies, ginger, garlic and tomatoes together with our special blend of spices and finally naaga chillies make this a truly sharp and spicy taste. Our aim is to serve truly authentic cuisine, with a selection of traditional and innovative new dishes created with a combination of superb facilities and a long-standing local reputation for excellence. A classic dish originating from the villages of the Punjab and often cooked in Asian homes in the UK. Pan-fried and garnished with fresh coriander and green chillies. The nation's favourite Indian main course, mild and creamy with a hint of coconut and a natural deep red colour. Derived from a dish served at the court of the Mughal emperors, marinated tandoori lamb or chicken fillets are cooked to a mild sauce with cardamom pods, pureed tomatoes and cream. Garnished with almond flakes and pistachio. A medium spiced Indian dish flavoured with methi leaves, exotic spices, onions and fresh garlic in a tomato and creamy yoghurt sauce. Prepared in a hot Indian style wok with fresh green chillies, garlic, ginger and tomatoes cooked quickly in a manner reminiscent of a stir-fry. Literally meaning 'hot-fry' the term entered the English language at the time of the Raj in India. We use the Jalfrezi method to cook green peppers, carrots, tomatoes, mushrooms, green peas and plenty of green chillies as the basis for a curry with just a little sauce. The chillies make the Jalfrezi taste very fresh. Like a balti dish in preparation, with the addition of a light pickle spice giving this dish a fresh and slightly tangy flavour. This is a medium strength spinach curry cooked with lots of fresh spinach leaves plus fresh green chillies, garlic, ginger and tomatoes in a medium balti sauce prepared in the chef's own inimitable style. A delicious combination of chick peas and roasted cashew nuts served in a medium spiced sauce. Succulent pieces of lamb or chicken stir-fried with fresh green chillies, ginger, garlic and onions. Red and green capiscums give this dish a vibrant appearance and a spicy taste. An Indo-chinese dish, cooked in an exotic mix of whole spices, with julienne-cut red and green peppers, whole dried red chillies, fresh tomatoes and a special chilli sauce. A mouth-watering, delectable dish for those who like it hot! hot! hot! A fiery dish cooked in the traditional style. Prepared with garlic, tomato, lemon, fresh green naga chillies and garnished with ginger. Cooked with spring leaf spinach, onions, fresh garlic, ginger, coriander, bay leaf, green chillies and cardamon juice to give a tasty, wholesone taste. Passion creates something special and our range of signature dishes showcase our chefs' skills and and desire for the food they make. King Prawns with paneer cooked in an exotic mix of whole spices, red green peppers, whole dried red chillies, fresh tomatoes and a special Nepalese chilli sauce. A colourful, spicy Nepalese dish, for something for Indian Ocean guests. A full piece of chicken breast cooked together with lamb minced meat, in medium balti sauce garnished with ginger, coriander and sliced boiled egg. Delightful perfect for the colder winter days, a traditional recipe available at hill stations like Muree. A meat lover抯 dream. A unique and delicious combination of chicken tikka, seekh kebab, lamb chop and lamb tikka served in a rich, medium-spiced Balti sauce with fresh green chillies. King prawns seasoned with salt and pepper, marinated with grated ginger, crushed garlic and yogurt, lime juice and ground chilli pepper. The King Prawn Tikka is cooked in a masala curry sauce, one of the most well known dishes in Indian cuisine. A full chicken breast cooked together with lean minced lamb and served in a spicy sauce of onions, garam masala and whole crushed red chillies. This satisfying dish is a real Indian Ocean favourite. Rich and buttery with a slight kick, our Taka Tak contains succulent lamb pieces, lean lamb mince and a unique blend of spices and fresh chillies. For centuries the various peoples of the Indian sub-continent have used vegetables for their health-boosting properties. As well as important vitamins, nutrients and fibre, vegetables also provide essential antioxidants to boost our immune systems. With this in mind our team of chefs have picked some stunning dishes to make the most of these properties, without sacrificing any of the fantastic taste and texture for which they are known. Curried potatoes and chickpeas, garnished with coriander. Peas and paneer (Indian cheese) cooked with onions, tomatoes, fresh coriander, green chillies and selected herbs and spices. Diced pieces of potatoes cooked with medium strength spices and tomatoes. Garnished with coriander and methi. A wonderful velvety dish with large, fresh cubes of Indian cheese and spinach, lightly spiced for a background flavour and aroma. Lentils cooked and sizzled in garlic sauce, garnished with coriander. Mushroom with fresh herbs and spices. Enhanced with saffron, pistachio, almonds & cashew nuts. This is our master Tandoor baker's speciality. Anyone tasting these simple unleavened and unsalted breads for the first time is soon hooked. Two all-time favourite gourmet experiences combined in one. They said it wasn't possible. Truthfully it's delightful! A southern Indian dish with hot and spicy taste Prepared with fresh herbs and tomato puree. Originally a Portuguese dish, transformed in colonial outposts from Goa to Madras to become the restaurant favourite that is enjoyed across Britain today. A fresh but fiery curry with tomato puree and herbs. Not for the beginner. Like its more famous cousin, dhansak, patia is a Parsee dish. Lightly fried onions cooked with tomatos to a natural red sweet and sour sauce. A hot dish with a distinctive aroma, garnished with fresh coriander. This is first and foremost a style of cooking in which the spices are gently fried to bring out their flavour before they are used in the recipe. Bhuna dishes themselves are made with meat cooked in its own juices, for deep strong flavours but very little sauce. The dopiaza is a classic Indian dish dating back at least to Mughal times. The name dopiaza broadly translates as 'double onions'� and a classic Indian dopiaza uses onions in two different ways, fried and boiled, at different stages of the cooking. The restaurant version has small fried pieces of onion in the sauce and then larger chunks of lightly cooked onion added towards the end of the cooking. Rogan josh is a long time favourite on the Indian Ocean menu. It was originally a Kashmiri dish but is equally at home in the Punjab. An authentic Rogan josh is delicately spiced and cooked to its distinctive deep red colour with the use of sweet pimentos, capsicums and tomatoes. A medium spice Indian dish flavoured with methi leaves, exotic spices, onions and fresh garlic in a tomato and creamy yoghurt sauce. Prepared in an hot Indian-style wok with fresh green chillies, garlic, ginger and tomatoes cooked quickly in a manner reminiscent of a stir-fry. Jalfrezi Literally meaning 'hot-fry' but probably better translated as 'stir-fry', the term entered the English language at the time of the British Raj in India. Our chef uses the jalfrezi method to cook green peppers, carrots, tomatoes, mushrooms, green peas and plenty of green chillies as the basis for a curry with just a little sauce. The chillies make the jalfrezi taste very fresh. Sagwala is a medium strength spinach curry cooked with lots of fresh spinach leaves, plus fresh green chillies, garlic, ginger and tomatoes in a medium balti sauce prepared in the chef抯 own inimitable style. A fiery dish Cooked in the traditional style. Prepared with garlic, tomato ,lemon and fresh naga chillies garnished with ginger. The nation's favourite Indian main course mild and creamy with a hint of coconut and a 'natural' deep red colour. Mild creamy, but never bland, a traditional korma requires long slow cooking of marinated meat abraised on a very low heat until all the juices condense down into a thick sauce with ground almonds, coconut and thick cream. Derived from a dish served at the court of the Mughal emperors, marinated tandoori lamb or chicken fillets are cooked to a mild sauce with cardamom pods, pureed tomatoes and cream. Garnished with almond flakes and pistachios. A medium & creamy house sauce cooked with green peppers to give a unique and nourishing flavour. Grilled breast chicken,baby carrots, broccoli and peas,served with chips or potato wedges. Strips of chicken tikka, salad and a sweet chilli relish,wrapped in a tawa roti. Served with chips or potatowedges. Traditional fish 'n chips, served with mushy peas. Tandoori nan stuffed with cubes of chicken tikka,mozzarella cheese and lightly spiced. Ocean relish and achoice of dips. Chicken tikka spiced up with tandoori peppers, onionsand tomatoes. Served with Irani Pilau, cooked withraisins and mild fragrant spices. A Beautiful tropical melange of rich Chardonnay and zingy Colombard. Lovely deep pink colour. Aromatic with hints of rose petals and appealingly gluggable. A rich, soft mouthful of succulent berry fruit with hints of jam. Astonishing concentration of fruit. Ripe blackberries and soft tannins combine delightfully. * Free Beer/Wine offer available for online orders only. Spend £19.00 and receive 2 bottles of beer or spend £30.00 to receive 4 bottles of beer or a bottle of wine. Beer brand is subject to change without notice. Offer is only available to those aged 18 and above, proof of ID may be required. As a responsible business we will not leave alcohol with people we feel to be under the age of 18 or heavily under the influence of alcohol. Please drink responsibly. For further information see www.drinkaware.co.uk. You have not ordered any rice, bread or other sundries. Would you like to add them? 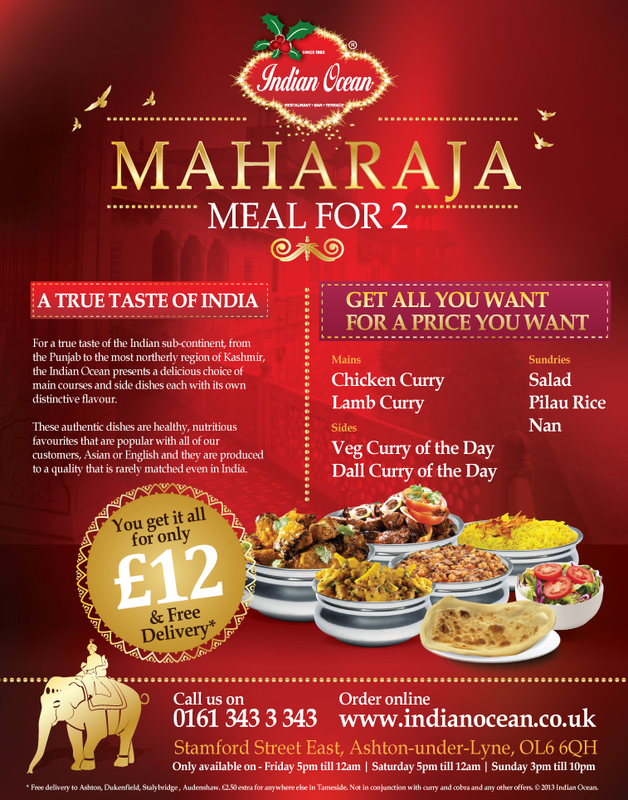 The Maharaja deal is available on Fri, Sat, Sun only. Due to high demand it is not possible to confirm Maharaja deal availability online at the moment. Please call the restaurant on 0161 343 3 343 to confirm.